Posted on February 24, 2017 by Smorgasbord - Variety is the Spice of Life. She graduated from Mount Holyoke college with a bachelor’s degree in Zoology and from Case Western Reserve University with a Ph.D. in anatomy. 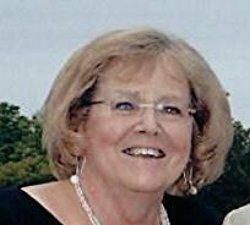 Following a career of research in developmental biology and teaching human anatomy to medical students and residents,the last 28 years of which were spent in the medical school of the University of North Carolina, she decided to try her hand at writing fiction. 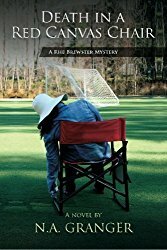 Apart from the three Rhe Brewster Mysteries, Noelle has also had short stories, both fiction and non-fiction,published in Deep South Magazine, Sea Level Magazine, the Bella Online Literary Review, and Coastal Style Magazine. Maine is a Happy State by Noelle Granger. As most of my followers and readers know, I have set my books in the seaside town of Pequod, Maine, which I created as a chimera of Boothbay Harbor, Camden and Bar Harbor. Maine is a wonderful state, aside from the winter months, with quintessential New England summers – great weather for swimming, sailing, hiking and camping, not to mention the many things to see – and eat! – there! I’ll tell you about a few things to see, based on my A-Z Challenge from two years ago, but first I want to tell you about why Maine is a happy place. It is ranked fourth after Hawaii, Alaska and South Dakota. According to Maine Biz, that ranking was announced as part of the Gallup-Healthways State of American Well-Being series, and Maine is up nearly 20 spots from last year. Boon Island Light is located on the 300-by-700-foot Boon Island, off the southern coast of Maine, nine miles from the beach at York. It is not open to the public, but from land, it can be seen from Cape Neddick. It is the tallest lighthouse in New England at 133 feet, and has a beacon that flashes white every 5 seconds. The idea of building a lighthouse on this tiny bit of land began in 1710, when the ship Nottingham Galley ran aground there, stranding the crew. The crew had to resort to cannibalism before they were found. A station and a day marker were established on the island in 1799, but granite tower with its light were not constructed until 1811, authorized by President James Madison. The Harriet Beecher Stowe House can be found on Federal Street in Brunswick. Stowe and her husband, Calvin Ellis Stowe, lived in this house for a short while. The house is also remarkable for having been the home of Henry Wadsworth Longfellow when he was a student. Today it is owned by Bowdoin College and is a National Historical Landmark. The Greek Revival style home was built in 1806 for Franklin and Mary Chamberlin. Fort Western in Augusta was built in 1754 built by the Kennebec Proprietors, a Boston-based company seeking to settle the lands along the Kennebec River that had been granted to the Pilgrims more than a century earlier. It is America’s oldest surviving wooden fort – a reminder of a clash of cultures that dominated New England life 250 years ago. This company, along with the Province of Massachusetts, wished to expand their interest in the area as part of the British and colonial effort to take political control of North American and sever the ties between the local Abenaki Indians and the French in Canada. The Fort was named for Thomas Western of Sussex, England, a friend of William Shirley, the longest-serving governor of the Province of Massachusetts (1741–1749 and 1753–1756) – crony capitalism in the 1700s. Fort Western served as a fortified storehouse to support Fort Halifax, 17 miles to the north. Supplies were shipped from Boston, unloaded there and then taken by a flat-bottomed boat upriver to Fort Halifax. Benedict Arnold stayed at the Fort with his Quebec Expedition in September of 1775. Some of Arnold’s officers, including Daniel Morgan, Aaron Burr, and Henry Dearborn, lodged in the Fort’s main house. The Fort’s military role ended after that, although the Fort itself survived because of the trading post/store. Maine has mountains! Maine occupies the northern part of the Appalachian Highlands region of the United States. Its physical features were determined by continental glaciers more than 10,000 years ago, which eroded and smoothed the hills and in places leveled the land. When the glaciers receded, they dammed rivers to created lakes, and left widespread debris in such forms as moraines, eskers, and drumlins. There is a wide variety of gentle mountains in Maine, which range from the eastern White Mountains to the peaks of the Rangely area to the remote Baxter State Park. Within these regions lie 14 of New England’s 4000 foot peaks. The Longfellow Mountains contain the terminus of the Appalachian National Scenic Trail, a 2,155 mile footpath that runs from Springer Mountain in Georgia to Mt. Katahdin in Baxter State Park in Maine. Maine is considered by many to have the most difficult, rugged, and beautiful part of the trail. So why am I not living in Maine? Probably the winters. I grew up with New England winters and survived four years of Chicago winters. If Hubs and I had not moved to North Carolina for our careers, and put down taproots while our children were growing up, we might have returned to the northeast. But Hubs is from upper New York State, which also has severe winters, and by the time we left Chicago, he’d had enough. I recommend a summer trip to this state – in addition to lobster, seafood, Maine blueberries, the weather is, for the most part, fantastic for sightseeing, sailing, hiking, and camping. Plus you will be among some of the happiest people in the country! At the annual Pumpkin Festival in the coastal town of Pequod, Maine, Rhe Brewster, an ER nurse and Police Department consultant, responds to screams at the site of the Pumpkin Drop. Racing to the scene, where a one-ton pumpkin was dropped from a crane to crush an old car, Rhe and her brother-in-law, Sam, Pequod’s Chief of Police, discover the car contains the smashed remains of a man’s body. After the police confirm the death as a homicide, Rhe embarks on a statewide search to identify the victim and find the killer. During the course of the emotional investigation, she survives an attempt on her life at 10,000 feet, endures the trauma of witnessing the murder of an old flame, and escapes an arson attack on her family’s home. There is clearly a sociopath on the loose who is gunning for Rhe and leaving bodies behind. With Sam unable to offer his usual support due to an election recall and a needy new girlfriend, Rhe realizes that the only way to stop the insanity is to risk it all and play the killer’s game. Crime fiction with engaging characters and a great plot, set in Maine. 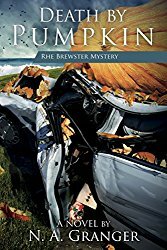 Death by Pumpkin is the third novel in the Rhe Brewster Mysteries, set in Pequod, a fictional town located in the coast of Maine. It can be read as a standalone, but the main characters are so engaging you’ll enjoy the series more if you start reading from book one, Death on a Red Canvas Chair, I loved them all! In book three, Death by Pumpkin, Rhe is recovering emotionally from her husband, Will’s unfaithfulness and murder, while she’s coping with two jobs, as a nurse at the local hospital and as a police department consultant, where her brother-in-law, Sam is the police chief. She also has a son, Jack, with ADHD, who is her priority. However, Rhe doesn’t wait for life to happen, she is a Rhe is intelligent, resourceful, brave, adventurous, determined, resilient and very loving and generous. In fact, she only has one negative quality is that she’s a terrible cook, although she’s learning! There’s lots of adventure in this instalment, too. A near plane crash, kidnapping, murder, being stalked by a deranged childhood friend. Rhe will also have to cope with Sam’s unusual emotional coolness due to his new girlfriend, as well as student protests leading to a recall of his job as chief of police, which he’ll have to reapply for, with uncertain results. The plot is neatly wrapped up at the end, but how will Rhe’s emotional life move forward? And which new crimes will she have to solve? Looking forward to book four, Death in Mudfat. Anyone who likes crime fiction set in an American town with engaging characters and a great plot will enjoy this novel. 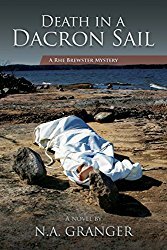 This entry was posted in Book Promotion and tagged Death by Pumpkin, Death in a Dacron Sail, Death in a Red Canvas Chair, Maine, murder mystery, N.A. Granger, Noelle Granger by Smorgasbord - Variety is the Spice of Life.. Bookmark the permalink. Thanks for this, Noelle. I knew nothing about Maine and you make it sound a lovely place to visit. It is the BEST place for a summer vacation, Mary. The only problem for me is the fact I like to swim, and there are precious few beaches. We usually look for some place with a dock to swim from. The only drawback. To offset it, there is incredible seafood (especially the lobster), Maine blueberries, and lots of antiquing places. Pretty drives along the coast, too. Maybe I should work for the state government? I think you’d be the perfect person to show visitors around. A great compliment from a genuine down Mainer! I had one extremely brief visit to Maine when I was living in NYC – and I can still taste the lobster and see the beautiful view just over the railing of the outside eating area. Even without butter it was incredible. The air smelled different too. I always intended to go back, and reading this I’m longing to do so. NC must have some compelling reasons to keep you there after penning this! Is there a companion piece to this post? I must say that I feel like I know Maine because Stephen King also sets a lot of his books there. I have wanted to visit Maine for years. No time like this summer! I think Stephen King has a little darker view of Maine than I do! It does, with the exception of beaches! Very rocky coast with mud flats! Great post. I love Maine. Lovely to hear from another Maine-o-phile! Maine has always seemed one of those beautiful picturesque and romantic places to live and your fantastic post confirmed all that and more! So you must go – summer of course, although even in February I found much to like. Debbie, I did my A-Z Challenge two years ago on places in Maine. For a bigger list, you can check it out! I was born with in Northern Maine and now live in central Maine near Stephen King’s city if Bangor. We are a happy bunch aside for a bit of grumbling toward the end of winter. It is a beautiful state and I’ve got to check out your books. Come and visit everyone! There is a lot to do here all four seasons and even winter is lovely. I have actually been to Maine in February! It was a bit cold…My books are carried by Sherman’s Bookstores, and I visit every year to sell. I will be in Damariscotta for the Pumpkin Festival this fall!